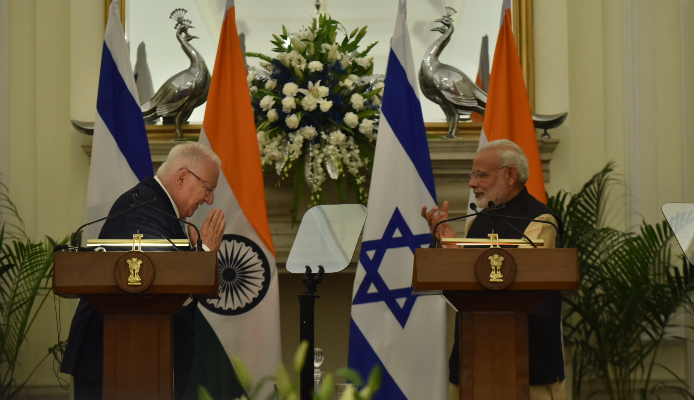 President Reuven Rivlin’s visit to New Delhi- the second-ever of an Israeli president marks 25 years of diplomatic relations between the two countries. The growing proximity between New Delhi and Jerusalem marks a new beginning with a weeklong state visit of the President Reuven Rivlin in India. Both Prime Minister Narendra Modi and President Rivlin expressed their willingness to strengthen mutual engagements between the two countries on all crucial fronts to counter regional and global challenges in a press conference held in New Delhi on Tuesday. In his welcome speech PM Modi called this visit a very crucial push to build new pillars of partnership between India and Israel. These engagements are focused primarily to boost multi-dimensional and wide-ranging ties in the areas of agricultural productivity, Research, Science and Technology, trade links, Intelligence and Security, Tourism and Educational. Both the leaders discussed about several other issues and also identified potentially strong areas of ongoing cooperation between the two countries. PM Modi praised Israel’s advances in agriculture, and its expertise in micro-irrigation and water management helpful for drought-prone areas in India. He also extended invitation to Israeli companies with promising opportunity to scale up ties with government schemes like Make in India, Digital India, Skill India, and Smart Cities. Rivlin said he shared India’s security concerns for its people, saying that nothing can justify terror. “I have no doubt that my visit here will help the ties and the cooperation between our two peoples grow stronger: in security and our ability to keep our people safe, in agriculture, in water, in technology, in culture and education.” He added. Earlier on Tuesday, President Rivlin and his wife Nehama were welcomed by President Pranab Mukherjee at Rashtrapati Bhawan. Pranab Mukherjee became the first Indian President to visit Israel last year. President Rivlin is accompanied by a delegation of Israeli businessman and he will be joined by his Indian counterpart in opening an agro-tech conference in the city of Chandigarh. President Rivlin ended his speech with invitating PM Modi to visit the historic city of Jerusalem, the capital of Israel.